Today in Tokyo, Fukuoka-based developer Level-5 held its annual press event. Kotaku Japan was in attendance as Level-5 revealed a handful of new titles. But what new titles? 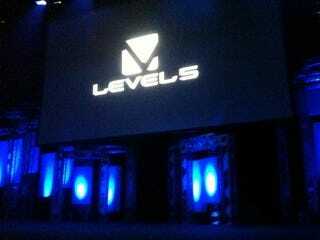 Before that, Level-5 presented previously revealed games. Several features were discussed for the Nintendo DS version of Ni no Kuni, including how the book, the "Magic Master", can be used with the game. Another new feature is the "tabi suru tamago" (traveling egg), which enables player to put message them and pass them to other players. It is also possible to crack open the eggs to collect whatever is inside. The DS version will have multiplayer battles, too. But, perhaps, it is the PS3 version that interests most. "We are currently diligently developing the game and are unable to show anything," said Level-5 honcho Akihiro Hino. The company did show off its upcoming Nintendo 3DS title, Professor Layton and the Mask of Miracle. The game depicts Layton at his current age and when he is in college. When it is released next February, the game will will get a new puzzle every day for the first year it's out. Level-5 also discussed the latest installment of its soccer role-playing game Inazuma Eleven, which is getting an anime as well. Level-5 is working on a new title with Jiro Ishii, who is best known for Sega game 428. The game is a story-heavy game called Time Travelers. The title is headed to the Nintendo 3DS. The game was previously made public, but Level-5 showed the game's trailer. In the trailer, a schoolgirl rides the subway, while a 24-style countdown clock ticks off the seconds. A man's voice counts down to one, and then appears behind the ground. Digital numbers fill the subway coach's windows. And the camera zooms in on the girl. The girl then stands on what looks like a clock tower over the city and asks why things have become the way they are. Level-5 also showed Little Battler. The game is slated for the PSP next spring and comes bundled with a Gundam-type plastic model of the in-game robot LBX AXOO. Another new title is Fantasy Life. The game is being developed for the Nintendo 3DS and features art by famed Final Fantasy composer Nobuo Uematsu and Final Fantasy artist Yoshitaka Amano. The next game is a Nintendo 3DS version of its role-playing hostess cell phone game called Kyabajoppi. The 3DS version will feature famed anime character Lupin the Third, among others. The last title is a Professor Layton crossover title with Ace Attorney for the Nintendo 3DS. With Ni no Kuni, Time Traveler and the Ace Attorney crossover, Level-5 looks to have a strong line-up of upcoming titles.